I am currently in the process of completely rewriting this application from scratch. The code for the old version was an absolute disaster, written nearly four years ago when I first started learning Python. The new version will be written in Python 3 and use PyQt5. Unfortunately I don't have a timeline on this new version but a rough guess for an early release would be early July 2014. Eventually I hope to get an actual stable release ready for Ubuntu 14.10 (Utopic) in October. Windows builds will be released when time permits. Windows XP/Vista/7/8 or a Linux distribution with PyGTK installed. 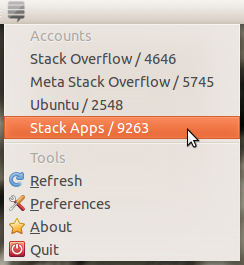 As told in the related ubuntu stack exchange question Would be great to port it to use app indicators. Find User even doesn't work. 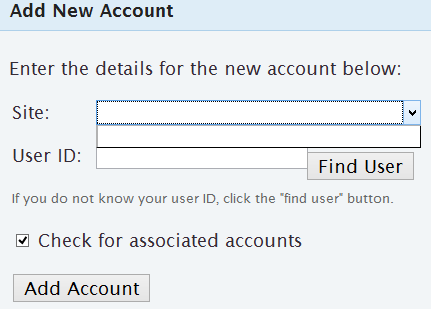 And without the site list, even if I enter my userID it doesn't "Add Account"
I have StackApplet installed on my Ubuntu system (using the deb package linked above). The About box says it is version 1.1 although the deb file name and package details both say it is version 1.2. Is there any change to make this also work in XFCE (for use in Xubuntu)? I must admit that I have absolutely no idea about the technical differences of both desktops. Is there a PPA available for stackapplet? FYI I have fully finished the Launchpad translation into Russian. Could somebody review? The 64 bit version tries to install itself in the Program Files (x86) folder. I am on win 7 64 bit on an Intel i5 processor. Since the filename reads amd64 I am assuming that I might as well install the 32 bit version, is this correct? At the moment a click on the widgets in the panel doesn't have a defined action. It might be handy to have a left click on a site widget open that site in the default browser. I have recently become active on Arduino Beta SE and I wanted to have notifs for that on my desktop. However, StackApplet doesn't have that site in the addable (???) sites. Is this a bug, as I know Beta sites can be added, I have Raspberry Pi working just fine; or is it just because Arduino hasn't been added to the list of sites somewhere? is there anything similar for KDE? My platform is Windows XP Service Pack 2. The new 1.6 (32-bit) version won't allow me to "authorize" the app?! I'm using a Vista OS. I've looked but haven't found any help elsewhere? Any ideas. p.s. Stackapplet is a great tool so i'm keen to fix it. The 1.5 version works but the 1.6 doesn't. Thanks again. Installed on Windows 7. On authorization, threw up a bunhc of dialogs about certificates missing, etc. Once running, the only thing I could do is look at my Inbox - there was no list of sites, no reputation. Removed for now, until more functionality is available. There are 30 new item(s) in your inbox. when there are only a few items in my inbox. Is it possible to configure the app to ignore some events (specifically reputation changes in my case, not really interested in them as much as the other ones)? Can this applet show when there is new activity since the last visit like the envelope next to my username? In other words, if I don't see the notifications does it change colour or something to tell me I should visit the site? If you're going to Appindicators I'd like to see this condensed to one icon which populates a dropdown list on click (but the libNotify messages are fine the way they are) Maybe something similar to the current messaging indicator? Would it be possible to add a preference where I can point the app to an accounts page (like this one) and it automatically picks up all accounts from there? Possibly even monitor that page for new appearing accounts? Because it is rather tedious to enter all those accounts individually and it should be very easy to retrieve the data for the app. BTW: thanks for writing the app!! it would be even nicer if the app could continually monitor the accounts and add new accounts automatically once they appear. I'm installing Ubuntu 11.04; I saw StackApplet in the Accessories menu. It claims that as of the newly installed version 1.4, StackApplet is no longer a Gnome 2 applet, but instead it'll live in the tray area... except I'm not even sure Ubuntu 11.04's Unity will have a tray area to begin with. Kinda baffled by the coincidence. At any rate, can you please consider improving the way the tray icon behaves? Currently it does nothing on right click and opens a menu in place on left click; if the tray bar is placed at the bottom of the screen, this puts the 'Quit' menu item squarely below where I clicked. Basically, clicking on the StackApplet icons closes it; I'd have to drag up to use the program itself. Is there support for http proxies? Thought I'd mention. I tried setting up StackApps in Windows 7, but at the preference screen for accounts associated with StackApps, it stalls on "loading..." and I'm not able to set up my accounts. Any ideas? ImportError: DLL load failed: Invalid access to memory location. Then nothing happens. Should the applet automatically appear somewhere, or do I have to start it manually? If so, how? Thank you George. It works for me (ubuntu 11) after installing via command prompt. Maybe it could be made also to start from the command prompt with the command stackapplet? Is it possible to get notifications about badges too? Not the answer you're looking for? Browse other questions tagged app notifier windows linux . Is there a Stack Exchange notification app for Windows 7? Is there an app to monitor reputation and new answers/comments?